Weekend Getaways near Augusta: Who doesn’t love a great weekend getaway, especially at a lovely country inn? For most of us, getting away from our lives, even if it is just for a few days, lifts our minds, body, and spirit. So let’s experience new adventures – and the perfect place for this trip is the North Georgia Mountains. Only 150 miles north of Augusta via Highway 17 North and Highway 441, but a million miles away from the traffic, stress and anxiety of the city. Need a special place to visit not too far from home. Come celebrate the season of awakening in Rabun County Georgia, located in the southern Blue Ridge Mountains. Beautiful mountain valleys, cool springs, roaring waterfalls, lush forests, shimmering lakes, famous hiking trails, a picturesque gorge, and a wild and scenic river. And stay at a luxurious award winning inn known for its serious food and wine credentials. Only 150 miles north of Augusta via Highway 17 North and Highway 441, but a million miles away from the traffic, stress and anxiety of the city. About 80% of Rabun County is comprised of publicly held land owned by the National Forest Service and Georgia Power Company, making it the best location in North Georgia to enjoy the outdoors. Stay in one of our cozy bed and breakfast rooms or one of our luxury mountain cabins — and simply relax. 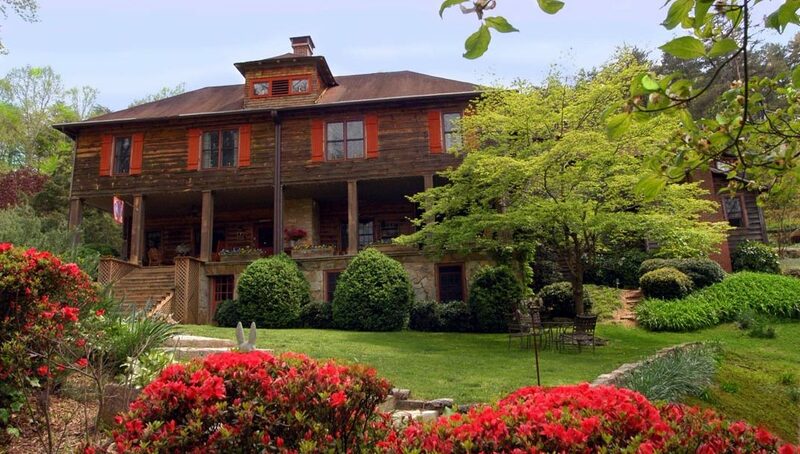 Beechwood Inn is surrounded on three sides by Georgia State Parks, so you won’t have to travel far from the property to enjoy the delights of the North Georgia Mountains. You’ll find everything you could dream of for the perfect get away to rest, relax and renew. Whether you are an outdoor enthusiast, a student of history, a prolific shopper or collector, or a gourmand or a farmer at heart, you can find it here, beckoning you, and waiting to delight you. Fall in love with the authentic North Georgia Mountain towns of Clayton, Dillard, Tiger, Sky Valley and Tallulah Falls. Rabun County boasts a number of “Farm to Table Restaurants” helping authenticate our status as “The Farm to Table Capital of Georgia” Rabun County is also filled with art galleries, antique and specialty shops, small towns with mountain atmosphere and friendly people. The Little Tennessee River starts in Rabun County and flows north into North Carolina. The Tallulah River starts in Rabun County and flows south, joining with the Chattooga River to become the Savannah River. Rabun County is the land of lakes and rivers . . .
Beechwood Inn’s restaurant, offers the best in casual fine dining in the North Georgia Mountains, so those on weekend getaways near Augusta don’t have to leave behind the culinary delights of the city. Our menu includes fresh seasonal and local ingredients to provide the best dishes possible. And the accommodations of our rooms, suites and cabins give you a place to retire for the night in true comfort.